Nawa-do = literally, "rope way"
Nawa - dojo means a "place of learning rope"
spiritual and sensual aspects of Rope Art. The way of love and harmony with rope. physical in doing his Art. Then he takes the model / partner on a deep meditative spiritual journey. explode with its natural pleasure sensors. (c) 1999. 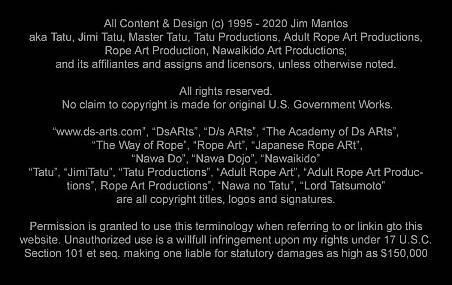 "The Way of Rope" (English) or "Nawa Do" (Japanese) is a phrase coined by Tatu. All rights reserved. Usage should refer the reader to Tatu Publications.